Spring mornings in southern Illinois are often wooly with the mists off the water. But, they are for fishing. No more so than on Cedar Lake near Carbondale, Illinois. Originally envisioned by Wayman Presley as a private lake for land development, Cedar Lake never got off his drawing board. The city fathers of Carbondale, determined that it was more important as a water source for the growing college town. They took over the project. The end result is a deep clear lake with no development along the shoreline and water that the citizens of Carbondale now consume. Started in 1973, this lake is nestled in the Shawnee National Forest, four miles southwest of Carbondale. Cedar Lake reached full pool by 1975. The shoreline belongs to the City of Carbondale and the U.S. Forest Service. The Illinois Department of Natural Resources manages the fishery. The awesome hills and cliffs enhance the fishing experience. To those who have fished Canadian shield-lakes, the surroundings will look familiar. The lack of development on the shoreline, rocky bluffs, and towering hills make one think of the unspoiled past frozen in place on this lake. Wildlife abounds in the woods that come right up to the water’s edge. Bass are the most popular species taken, but bluegill, crappie, catfish and a few walleye also prowl these waters. Largemouth bass fishing in Cedar Lake is good with numbers of legal size and trophy bass. There is a 14″ – 18″ protected slot length limit. Harvest of bass less than 14 inches appears to be almost non-existent according to IDNR studies of the lake. The daily creel limit on this lake is five bass under 14 inches and one over 18 inches. Anglers are encouraged to harvest the bass less than 14 inches to improve the overall condition of the population. Thinning out of the smaller bass increases the growth rate and body condition of the remaining fish. Largemouth bass take such crankbaits as Pop-R and Rat-L-Traps. 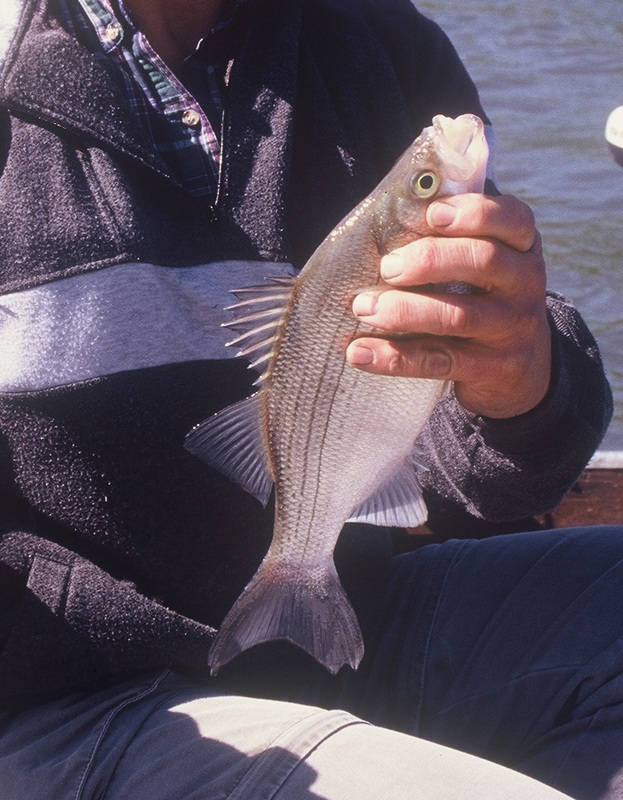 During the first half of the month, the bass are usually just completing their spawn. Although the females are not actively feeding, the males are protecting the nests. They guard the nests until the fry hatch and for several days later. This makes the males very aggressive and they will attack lures presented to them. Fish are off drop-offs and ledges, the basic structure in the lake. Early in the month bass will be in the shallows and bedding areas. The smaller fish seem to be shallow and the larger fish in deeper water. Later in the month they move around the points and break lines leading to deep water. Springs best fishing seems to be in about 20 feet of water. For those deep fish, try a plastic worm at about 25 feet. Crappies tend to be off structure in 12 to 14 feet of water. They begin to school up near major points, drop offs, and creek channels. They can be quickly located by trolling small crankbaits through the areas over structure. Areas with good cover are best. Minnows and small jigs are the preferred baits, with the average fish running 8 to 10 inches in length. Bank anglers do well with bluegills. May is usually the first and best spawning month for this species. Early in May, they will take mealworms and red wigglers. Red wigglers and crickets are the ticket later in the month. Suspend the bait is beneath a very small float for the best action. Most fish come from about 6 feet of water early in the month and get deeper as it wears on. By the end of the month they could be as deep as 15 feet. Channel catfish prowl the shorelines in search of food and a place to spawn. Bullheads, a catfish sub-species are here as well. Worms and nightcrawlers are the favorite food of these fish this month. If the weather is unseasonably cool, then dip-bait, a cheese based lure can produce results. In warm weather, the results are not so consistent. 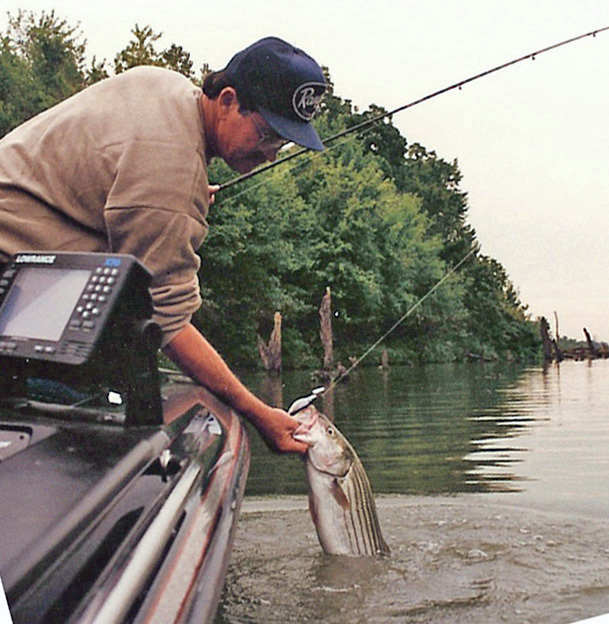 Most fishing on Cedar Lake is from boats with access in a number of locations. There is a 10-horsepower limit on boat motors. For more site specific information on regulations, contact the U.S. Forest Service, Shawnee National Forest, Murphysboro, IL 62966. The phone number is 618-687-1731. 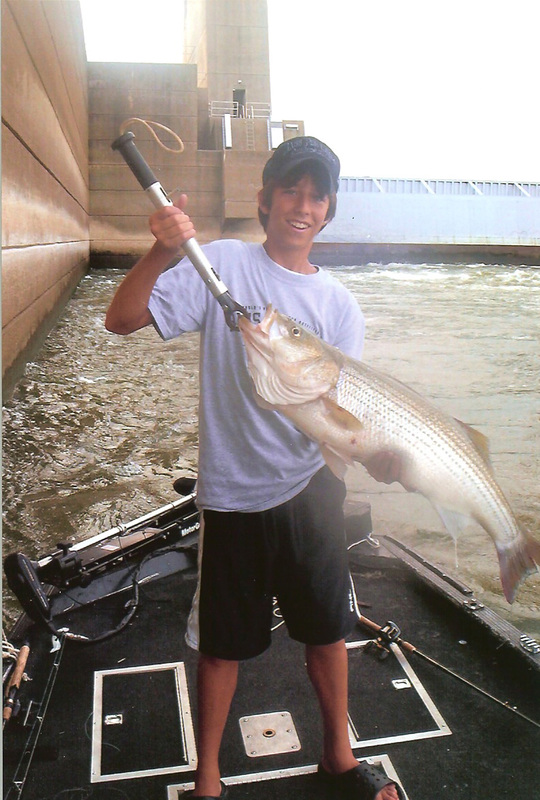 In a previous posting of this blog I told of fishing below Kentucky Dam for stripers. 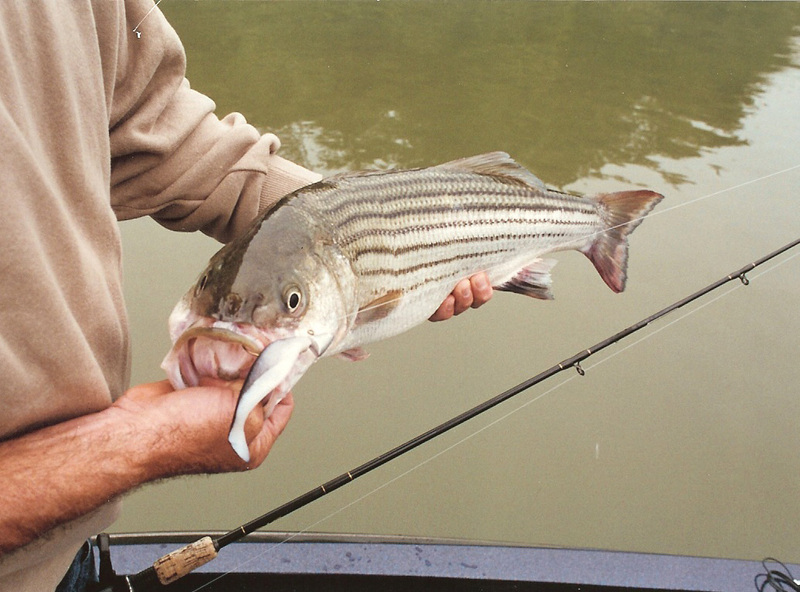 (Tailwaters & Hybrid Stripers) That was Day 1 of my cruise across western Kentucky to attend the AGLOW Spring Cast & Blast at Eddy Creek Marina and Resort. Day 2 begins in a tackle shop next to the Pelican Restaurant in Lake City, KY. Guide Jim Doom (www.kybeaver1.com) and I loaded up for a shot trip down to the ramp on the Tennessee River. Jim guides for catfish, bluegill, redear, sauger smallmouth as well as our target for today of Hybrids and White Bass. The wooly mists dissolved into the woods as we approach the ramp and drop the boat. The water is rising and Jim explains that it is water that is backing up from the Ohio River as it enters the flood stage. First item on the agenda is to catch some shad for bait. You can’t get any more fresh bait that this. A few casts of the bait net and we had some gizzard shad in the bucket. But, we cannot find any threadfin shad which are Jim’s preferred choice. We move up river to Kentucky Dam from whose shore I had fished yesterday. The rig was simple. A bait cast reel with 12 pound line is the basic tool. The end of the line contains a 2/0 circle hook with the gizzard shad attached. About two feet up the line from the hook and bait, a drop line with a sinker is attached. The result is the sinker moving along the bottom with the bait held just off the bottom to entice a striper. Drifting from the dam area down stream a couple of hundred yards does not produce any bites. We repeat the process a number of times with no results. We even attempt to anchor near the bridge downstream with similar results. Jim sees some threadfin shad in the rip rap and our luck is going to change. A single cast of the bait net catches a goodly number of threadfins. We motor downriver several miles to a spot that Jim knows well. A grain field is flooded and a current break is formed on the shore. We switch to spinning gear and lighter line but with the same rig. The exception is that we now have threadfin shad as bait. Casting to the shoreline, we allow the bait to drift down stream toward some flooded brush and timber. Almost immediately, Jim catches a couple of hybrids and I hook into a nice smallmouth bass. I lose the smallmouth. Soon we are catching hybrids and white bass with regularity. We continue until our time is almost over. Deciding to give the smallmouth bass a try, we move to another area. There we anchor between a barge and a rip rap cove. Shortly I hook into a nice channel catfish right up on the rip rap only inches from the shore. Jim catches a nice smallmouth and our time is over. It is back to the ramp. 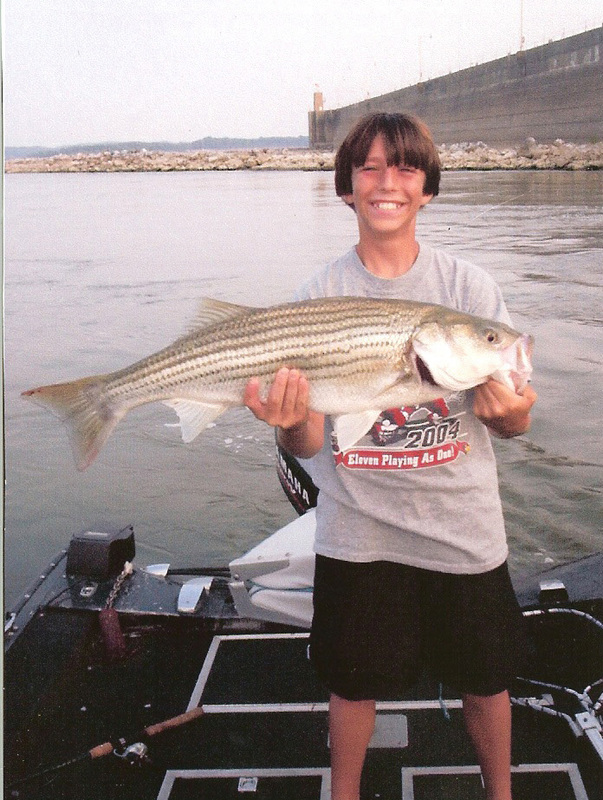 Our catch for the day consists of hybrid stripers, white bass, channel catfish, Asian carp, smallmouth bass, threadfin shad, gizzard shad, and yellow bass. Not a bad half day.